Looking back at the game later on in life, a lot of its plot points/twists were just too damn convenient or contrived for me to take seriously. I did really enjoy seeing so much of Squall’s internal dialogue, in which he reveals that he’s a talented, seriously deluded young man who’s terrified of loss and being hurt while putting up that tough, lonely exterior. 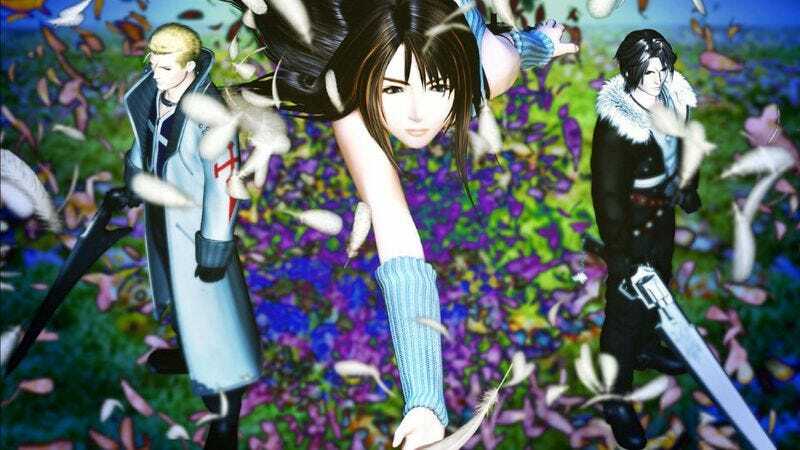 Squall’s a jerk, no doubt about it, but a lot of us were at that age, putting up tough fronts while being so enveloped in our personal pain or failure that we fail to see the friends we have or the opportunities/possibilities that lie waiting in front of us. When he starts to realize that, he begins to take his natural talent for leadership and put it to good use, while not neglecting the people who stuck by him throughout the story. Compare that to Seifer, who basically bought into his childhood dream at the cost of his free will and sanity, dragging his friends along (who clearly never wanted to take things as far as he had but stuck by him regardless). Even then, Seifer still gets a shot to redeem himself, which he actually takes! The plot might not hold up to scrutiny, but those developments are interesting, and the theme of coming into one’s own and growing as a person, not in spite of, but because of pain and struggle is a timeless one. Another thing that this game nailed is how easy it is to get distracted, and sucked into your own head as a teenager. I loved how Squall’s inner monologue would often overlap another character’s dialogue. Cid or Laguna would be delivering some key bit of exposition, but it was hard to read as Squall’s thoughts about Sis or Rinoa would keep getting in the way. No matter how much you want to focus, you can’t do it. I adored the mundane details included in Final Fantasy VIII to flesh out daily life at Balamb Garden. All the small moments in between the insane monster-fighting classes and beachhead missions really drove home the idea that these kids were in school and had all the same sources of stress as me (plus the ever-present threat of dying). They had to get to class on time, make sure they were wearing the right uniform for the day, go to the infirmary after a fight with the class bully, and then later attempt to assassinate an evil sorceress/mayor on a contract negotiated by the school. The part that stuck out the most was the multiple references to the popularity of the cafeteria hot dogs. We definitely had one or two lunches each month that everyone got excited for at our school, and it killed me that Squall could never make it in time to try the hot dogs! And of course, it was awesome that you could find adults in the game that played the most popular collectible card game in the world. I was an avid, if terrible, Magic: The Gathering player at the time, with only a vague sense that people could enter real live Magic tournaments. The idea that half the people you run into in FF8 not only play the card game, but also keep their deck on their person at all times, was somehow both an unbelievable fantasy and a view into a subset of society that I later learned I had no interest in. And despite the weird futuristic design of Balamb Garden, there were just enough touches to make it feel like an expensive boarding school. The dorms were tiny, the entire campus consisted of a handful of wings with discrete purposes, and there were a few areas that were off-limits to students to provide that air of mystery reserved for the teacher’s lounge or the locked room where all the old band instruments are stored. In my school, you might have found a tarnished contrabass clarinet, but at Balamb, you find a mechanism for lifting the school off its foundation and turning it into the least efficient vehicle in video games. Either way, it’s just another day at school, and you better get to gym class before they take attendance. I played FF8 when I was 13 years old, and like a lot of people, I was in the perfect state to respond to it. I had moved to a new country a year earlier and didn’t yet have any friends at school. Being foreign (even though I was still in an English-speaking country) was fairly alienating at that age and forced me into aloofness. I was back in America having major surgery when the game had come out. I had already discovered and utterly devoured FF7 and Tactics, but I had gone into those barely knowing anything about FF, whereas I approached FF8 with huge anticipation. I remember recovering from the operation with a newly bought copy of the game and a PlayStation rented from Blockbuster, and it was utterly immersive. I found it quite powerful at the time due to the mix of escapist fantasy and familiar high school archetypes this article highlights. Looking back at it now, I have a soft spot for the game because of the circumstances under which I first played it, but it is a ridiculous and surreal mess of a game, which is so bonkers that it has a completely different charm to me now. As a high school teacher, this article kind of makes me want to play through this game again. I played it (and loved it) on release, and even played through the first disc again a few years ago, but I never recognized the connection to the high-school mind. It’s especially difficult to deal with this attitude in students today because they have 24/7 access to all the drama they could possibly want. Students could walk into class fine, and by the end be ready to fight a student on the other side of the building because of some tweet. They may even ask to go the bathroom and have it out right then and there. Seniors in high school are beginning to understand that all this won’t really have any bearing one year later (one student once told me she had a lucid moment over a weekend when she realized how stupid all her drama at school was—all she needed was to be removed from it for a few hours), but this life-or-death attitude is difficult to teach with. Or maybe if I played it now, it’d just be more work. Today is April 8, which means it’s time for another of the Gameological community’s Mario Kart 8 On The 8th events. Our humble organizer, DL, won’t be attending tonight, but the race must go on. The event begins at 8 p.m. central time, and the code you’ll need to access the race is 2768-4008-1240. You can find all the pertinent right here in DL’s post. Good luck! And with that, we bid you farewell for the week, Gameologians. Thank you for reading and commenting. We’ll see you next week!